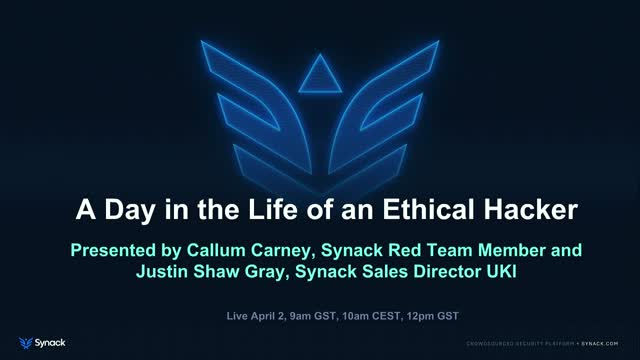 The Synack Red Team (SRT) gives the most talented security researchers across the globe a platform to do what they love and get paid for it. A private network of highly-curated and vetted security researchers, the SRT is challenged every day to deliver exploitation discovery and management for some of the biggest brands in the world. On the Synack platform, researchers have access to the industry’s first ever hacker toolkit built at enterprise scale, to make them more efficient and effective at uncovering critical vulnerabilities that matter. These ethical hackers are increasingly being recognised as an important way for businesses to unearth security weaknesses before they can be exploited by online criminals. - Processes used when a new target comes online. Callum started his ethical hacking journey by supporting organisations such as Google, Spotify and Local UK Businesses to secure their systems. In January 2017, after noticing all of the great comments regarding the Synack platform (fast payouts, fast response times, etc), he applied for the Synack Red Team and was accepted. During his time with Synack he has worked to secure a multitude of systems including government and Fortune 500 enterprise systems. In addition to his work with Synack Callum is studying for an Undergraduate Masters Degree in Computer Science and working as a Software Tester/Developer for the UKs largest supplier of Functional Skills and GCSE assessments. As cybercrime continues to evolve and the consequences and damages of an attack continue to increase, it is vital to manage vulnerabilities through security testing. Security Testing can be done in several different ways, the one that's best for you is the one that aligns with your threat model and traditional concerns. Join Doug Cody, Solutions Architect, Synack as he discusses the roles of scanners, penetration testing, bug bounty, AI and more. What do you get when you buy a penetration test? If it’s the same thing you got last time - maybe you’re not getting enough for your money. Technology for monitoring testing, analyzing traffic, and crowdsourcing have changed pen testing forever. We asked CISOs from the Global 2000, government agencies, and high-growth companies about their 2019 priorities. Across the board, they answered: effective, efficient security that is grounded in trust. What’s your standard penetration testing getting you? Compliance and a vague summary report. What could you get with a crowdsourced penetration test from Synack? - Own the IP of all discovered vulnerabilities with none of the liability. -How often do they run in a network environment? -What’s covered in their data output and reporting? Mike will present how government agencies are reinventing how they conduct security testing to achieve greater efficiency and ROI. Learn how your agency’s security team CAN achieve security without compromise. BIO: Mike Larmie, Federal Solutions Architect at Synack has more than 20 years of IT Security Experience, and has been involved with countless missions within the DoD, Intel and Civilian Federal Agencies. He has a wealth of experience having worked at companies such as Tenable, Sourcefire, Rapid7, Infoblox, G2 and others. Join Synack on a journey as we provide an overview of different crowdsourced security testing models such as Crowdsourced Penetration Testing, Bug Bounty, and Vulnerability Disclosure Policies. We will cover insights discussed in our recently published white paper, Crowdsourced Security White Paper: Adoption and Market Trends in the U.S. Government, and highlight the key differentiators in crowdsourced security models including vetting, technology, practical applications, and pricing. Come away with an understanding of what model(s) are right for your agency! Consumers are upping the ante for CISOs in 2019! >19% of consumers reported that they would not feel comfortable shopping at a store that has been breached or using an online service and 50% of consumers claim that security was a priority when choosing a bank. From eCommerce to Financial Services: trust is top of mind for consumers, and trust is becoming a core part of the CISO charter. - The security challenges CISOs face in eCommerce and how they are integrating crowdsourced security into their day-to-day operations to build trust with the board and with customers. - And Kevin's perspective on which security programs are actually worthwhile and where innovation is needed. What works? What doesn’t? The European Central Bank created a framework to provide guidance to leaders at financial institutions to help them secure their organizations. TIBER standardizes how to source and conduct an intelligence red team assessment so you can better protect your organization. - How Synack’s AI-powered security testing platform was created to help security leaders demonstrate adherence to regulatory standards and utilize effective vulnerability discovery in order to best protect their digital assets. - How Synack’s hacker-powered security platform offers top quality testing results and expert insights on TIBER compliance and remediation routes, packaged in an efficient solution that doesn’t burden your team or usurp your control. - And how your journey with Synack will ensure you gain efficient, effective results with zero compromise. Penetration testing is not a new concept – and that’s the problem, especially for financial institutions working to protect their financial assets and customer data in a modern, digital economy. Banks, credit card companies, digital currency exchanges, and other financial institutions from the Fortune 500 to early stage companies are turning to crowdsourced security to get beyond penetration testing and achieve both real security and compliance. Karl Schimmeck, Executive Director, Global Head of Vulnerability Management at Morgan Stanley, recently took the stage with Jay Kaplan, CEO & Co-Founder of Synack, and Mikhail Sosonkin, Synack Red Team member, at leading payments conference Money20/20 to talk about how the industry is conducting more aggressive security testing in a controlled, efficient, results-oriented way. Under Secretary for the Department of Homeland Security’s National Protection and Programs Directorate (NPPD) Chris Krebs and tech leaders Synack, Microsoft, and Cloudflare came together in Washington D.C. today through a “Security and Democracy” event convened by TheBridge. This event brought together private companies who are driving election security initiatives with the Department of Homeland Security to discuss the election threat landscape, the progress of public-private collaboration efforts to secure the election process, and the future outlook on local elections and election security. SAP HANA environments have complex architectures with large attack surfaces and many potential breach points. They are often exposed and external facing to a large extent i.e. SAP FIORI Apps. Traditional compliance-based pen tests and vulnerability scanning simply aren’t able to mimic sophisticated cyber attacks in order to find and fix exploitable vulnerabilities. This puts your organization at great risk of being compromised, data breaches and GDPR violations. So what are the options? – Ron Peeters, Managing Director EMEA of Synack, a Silicon Valley based leader in Offensive Security Testing. Synack Co-Founder and CEO Jay Kaplan talks about the past, present, and future of the company with Ed Amoroso of Tag Cyber. DevOps allows organizations to bring web, mobile, and IoT applications to life faster than traditional SDLC models. However, continuous releases and updates introduce new risks by the way of exploitable vulnerabilities that are introduced and left undetected and unresolved/unpatched in the production stream. Traditional point-in-time penetration tests can’t keep up with the frequency and short deployment cycles of the modern DevOps organization. Traditional pen tests are usually conducted through checklist-based activities that lack the comprehensiveness to mimic and defend against sophisticated cyber attacks. The result? An increase in serious, exploitable vulnerabilities in live applications and a slew of high-profile breaches.. Leading enterprise organizations are utilizing a crowdsourced security testing platform that combines continuous vulnerability scanning tools with manual, crowdsourced human security testing. This model of offensive and adversarial-based testing delivers realistic attack traffic on customers’ applications, resulting in effective vulnerability discovery and management and “smart” security intelligence without compromising security and control. Scalable and controlled crowdsourced testing at a continuous cadence is the answer for secure DevOps SDLC. Rajesh Krishnan, Product Marketing, Synack. To beat criminal hackers, it helps to have ethical ones on your side. Responsible Disclosure Programs - where companies invite suspected security vulnerability reports from the public - have been on the rise in the past few years. Should your company consider Responsible Disclosure? Learn more about the ins and outs of these types of programs and how they can differ in the level of liability and management incurred. Technical. Social, Legal, and other indicators will all be raised. Synack is a security company revolutionizing how enterprises view cybersecurity: through a hacker’s eyes. Synack’s private, managed hacker-powered security solution arms clients with hundreds of the world's most skilled, highly vetted ethical hackers who provide a truly adversarial perspective to clients’ IT environments.